$6 in Surprise Peelie Sticker Coupon Savings! Adding another layer of savings with Peelie Sticker Coupons is always a pleasant surprise! Christa Clips shares tips for using these coupons that you find stuck to products on the shelf! My husband and I finished a HUGE overhaul of our storage room and pantry this weekend and I now have room to start stocking up on some items for upcoming holiday parties. I was thrilled to find some Peelie Sticker Coupons on these items at a local grocery store* last night and saved an EXTRA $6 on top of the sale price. I didn’t spend any time or energy … anyone can do this! My total out of pocket for these 6 items was $6.94 and I didn’t spend any time or energy checking flyer prices and clipping coupons. Anyone can do this! buy 1 product at a time and go back for a new transaction to get another Peelie Sticker Coupon when you buy the 2nd, 3rd, 4th, etc. when storing these Peelie Sticker Coupons for future use, stick them on a piece of taught Saran wrap so that the text can be read easily and the sticky goop won’t get all over your coupon binder or wallet! Can I use the Peelie Sticker Coupon with a sale price, price-matching and other coupons? Yes, you can ask the cashier to Price Match a competitor’s price and then use the Peelie Coupon Sticker as well. The Price Match is computed as a price revision, not a coupon. Peelie Sticker Coupons can be found in a variety of stores and on a myriad of products. Sometimes the special packaging comes straight from the supplier, other times a representative will be in the store affixing the Peelie Sticker Coupon (or tags with elastics on bottles) during specified promotion periods. Joining a local couponing group on facebook or other social media channels is a great way to keep informed of where the Peelies are in your local haunts! Saving at the grocery store plays a big part of my Save-at-Home-Mom strategy: I stock up on items that I know we’ll be using whenever I can find at least 2 layers of savings. The best I’ve ever done on an item to date was 7 layers of savings. I’ll tell you all about it sometime! 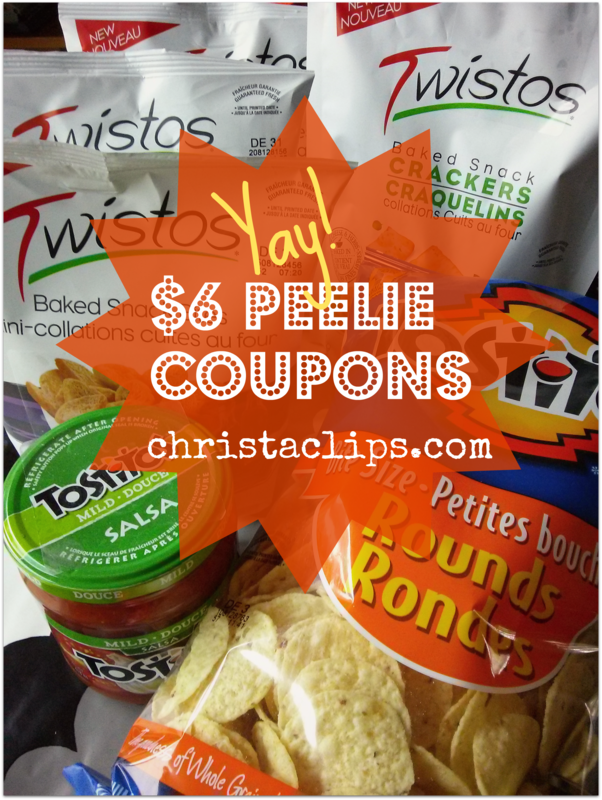 Posted on November 6, 2013, in Christa Clips, Couponing and tagged Christa Clips, Couponing in Canada, Peelie Sticker Coupons. Bookmark the permalink. 2 Comments. Good tip about taking off the peelies… I hate it when I buy a 50% markdown or other stickered item and get home and find the sticker still on it and have paid full price! i agree, Maranda – especially if we’ve chosen the product BECAUSE of the sticker savings! I treat the 50% mark down products a little differently since you can’t peel those stickers without ruining them (they’re perforated to rip if tampered with – I suppose to prevent people from peeling them and sticking them on other items). I usually put my mark down items on the belt FIRST and point out to the cashier that “these 5 items have (bright pink, hard to miss) stickers!”. I do keep an eye on the display screen, just to be sure.